Waltke, B. K., and C. J. Fredricks. Genesis. Zondervan, 2001.656 pp. Enns, P. Exodus. NIVAC. Zondervan/Hodder & Stoughton, 2000. 624 pp. Hartley, J. E. Leviticus. WBC. Nelson/Paternoster, 1992. lxxiii/496 pp. Hess, R. S. Leviticus. REBC 1. Zondervan, 2008. Pp. 563-825. Kiuchi, N. Leviticus. AOTC. InterVarsity, 2007. 538 pp. Milgrom, J. Leviticus 1-16. AYBC. Yale University Press, 1998. Leviticus 17-22. AYBC. Yale University Press, 2000. Leviticus 23-27. AYBC. Yale University Press, 2001. xviii/1163 pp., xvii/624 pp., and xxi/818 pp. Wenham, G. J. The Book of Leviticus. NICOT. Eerdmans, 1979. xiii/362 pp. Cole, R. D. Numbers. NAC. Broadman, 2001. 590 pp. Milgrom, J. Numbers. JPS Torah Commentary. Jewish Publication Society, 1990. lxi/520 pp. Olson, D. T. Numbers. Interp. Westminster John Knox, 1996. 210 pp. Hess, R. S. Joshua. TOTC. InterVarsity, 1996. 352 pp. Hubbard, R. L., Jr. Joshua. NIVAC. Zondervan, 2009. 656 pp. Butler, T. Judges. WBC. Nelson, 2009. xcii/538 pp. Hubbard, R. L., Jr. The Book of Ruth. NICOT. Eerdmans, 1988. xiv/317 pp. Firth, D. G. 1 and 2 Samuel. AOTC. InterVarsity, 2009. 614 pp. Provan, I. W. 1 and 2 Kings. UBCS. Baker Books, 1995. xiv/306 pp. Dillard, R. B. II Chronicles. WBC. Nelson/Paternoster, 1987. xxiii/323 pp. Japhet, S. I and II Chronciles. OTL. Westminster John Knox/SCM, 1993. xxv/1077 pp. Williamson, H. G. M. Ezra-Nehemiah. WBC. Nelson/Paternoster, 1985. xix/428 pp. Berlin, A. Esther. JPS Bible Commentary. Jewish Publication Society, 2001. lix/110 pp. Jobes, K. Esther. NIVAC. Zondervan/Hodder & Stoughton, 1999. 256 pp. Grogan, G. W. Psalms. THOTC. Eerdmans, 2008. xi/490 pp. VanGemeren, W. Psalms. REBC 5. Zondervan, 2008. 863 pp. Wilson, G. H. Psalms. Vol. 1. NIVAC. Zondervan/Hodder & Stoughton, 2002. 1024 pp. Fox, M. V. Proverbs 1-9. AYBC. Yale University Press, 2000. xix/474 pp. Waltke, B. K. Proverbs 1-15. NICOT. 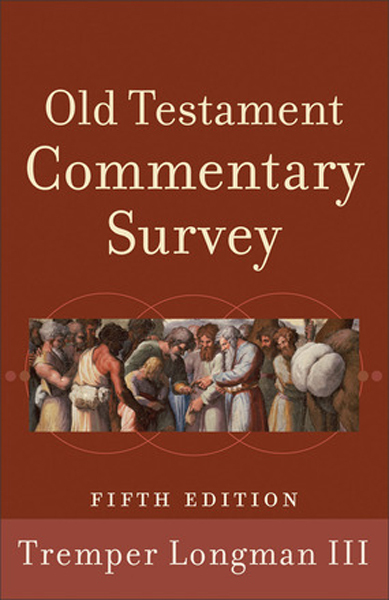 Eerdmans, 2004. Proverbs 16-31. NICOT. Eerdmans, 2005. 729 pp. and 624 pp. Bartholomew, C. Ecclesiastes. BCOTWP. Baker Academic, 2009. 448 pp. Oswalt, J. N. Isaiah. NIVAC. Zondervan/Hodder & Stoughton, 2003. 736 pp. Sweeney, M. A. Isaiah 1-39 with an Introduction to Prophetic Literature. FOTL. Eerdmans, 1996. xix/547 pp. Fretheim, T. E. Jeremiah. SHBC. Smyth and Helwys, 2002. 684 pp. Lundbom, J. R. Jeremiah 1-20. AYBC. Yale University Press, 1999. Jeremiah 21-36. AYBC. Yale University Press, 2004. Jeremiah 37-52. AYBC. Yale University Press, 2004. 960 pp., 672 pp., and 656 pp. Parry, R. A. Lamentations. THOTC. Eerdmans, 2010. xii/260 pp. Provan, I. Lamentations. NCB. Sheffield/Marshall Pickering, 1991. 134 pp. Block, D. I. The Book of Ezekiel 1-24. NICOT. Eerdmans, 1997. The Book of Ezekiel 25—48. NICOT. Eerdmans, 1998. xxi/887 pp. and xxiii/826 pp. Duguid, I. Ezekiel. NIVAC. Zondervan/Hodder & Stoughton, 1999. 576 pp. Collins, J. J. Daniel. Hermeneia. Fortress/SCM, 1993. 499 pp. Dearman, J. A. The Book of Hosea. NICOT. Eerdmans, 2010. xiv/408 pp. McComiskey, T. “Hosea.” In The Minor Prophets: An Exegetical and Expository Commentary. Ed. T. McComiskey. Vol. 1. Baker, 1992. Pp. 1-237. Dillard, R. B. “Joel,” In The Minor Prophets: An Exegetical and Expository Commentary. Ed. T. McComiskey. Vol. 1. Baker, 1992. Pp. 239-313. Paul, S. M. Amos. Hermeneia. Fortress/SCM, 1991. xxvii/406 pp. Raabe, P. R. Obadiah. AYBC. Yale University Press, 1996. xxvi/310pp. Sasson, J. M. Jonah. AYBC. Yale University Press, 1990. xvi/368 pp. Walton, J. H. Jonah. REBC 8. Zondervan, 2008. Pp. 451-99. Baker, D. W., T. D. Alexander, and B. K. Waltke. Obadiah, Jonah, Micah. TOTC. InterVarsity, 1988. 207 pp. Waltke, B. K. A Commentary on Micah. Eerdmans, 2007. xviii/490 pp. Waltke, B. K. “Micah.” In The Minor Prophets: An Exegetical and Expository Commentary. Ed. T. McComiskey. Vol. 2. Baker, 1993. Pp. 591-764. Berlin, A. Zephaniah. AYBC. Yale University Press, 1994. xvi/165 pp. Meyers, C. L., and E. M. Meyers. Haggai; Zechariah 1-8. AYBC. Yale University Press, 1987. Zechariah 9-14. AYBC. Yale University Press, 1993. xcv/478 pp. and xxiii/552 pp.